Ankara is the administrative center of Turkey and a huge university town, so it has a large population of government workers and university students. As the national capital, Ankara is home to a large population of foreign diplomats and embassy staff, so it offers goods and services that might be more difficult to find in other Turkish cities. Ankara is a sprawling, modern city which can appear as little more than a dull, concrete jungle at first glance. As a result, many tourists tend to use it merely as a transit point for getting to places like Konya or Cappodocia. However Ankara does have a lot to offer for those prepared to look a bit deeper. Ankara has a symbolic significance for the secular Turks. It is the place where a new era for the Turkish people started. It is a symbol for independence, development and Western values. Ankara was a small town of few thousand people, mostly living around Ankara Castle, in the beginning of the 20th century. The fate of the city has changed, when Mustafa Kemal Atatürk and his friends made Ankara the center of their resistance movement against the Allies in 1920, and established a parliament representing the people of Turkey, against the Allies’ controlled Ottoman Government in the occupied Istanbul of post World War I. Upon the success of the Turkish War of Independence, the government in Istanbul and the empire is abolished by the Grand National Assembly of Turkey in Ankara in 1923, and the Republic of Turkey is established. When you look at the modern Ankara of 5 million people today, almost all you see is built afterwards. This doesn't mean that Ankara does not have history. Located in the center of Anatolia, Ankara’s history goes back to second millennium BC. Footsteps of Hittites, Phrygians, Lydians, Persians, Greeks, Galatians, Romans, Byzantines and the Turks are still present. The name Ankara is originated from the Celtic word of Ancyra, meaning Anchor. The original reason of the use of the name anchor in an inland city is not certainly known, but there are several different myths. King Midas, whose touch has turned everything into gold in the mythology, is buried in the ancient site of Gordion, in suburban Ankara. If you are traveling through Ankara’s Esenboga Airport, look to the wide fields around. This is where Timur the Lane defeated Ottoman sultan Bayezid I in 1402, on the great Battle of Ankara. The district of Esenboga keeps its name since then, as one of Timur’s famous generals and the commander of his famous elephant fleet “Isin Boga” has set his base here. Ankara is recaptured by the Ottomans in 1403, and remained under Turkish control since then. Apart from the old town in and around the citadel near Ulus and unplanned shantytown neighbourhoods inhabited by people from rural areas in the last five decades, most of Ankara, which was a provincial town of 20,000 people in the early days of the Republic, is a purpose-built capital due to its strategic location at the heart of the country. The history of settlement in the area is millenia old. The biggest claim to fame of the town used to be the long-haired local breed of goats named after former name of the city (Angora), out of which high quality mohair textiles were produced, today the only place where you can spot them in city is the lawns on the side of a clover-leaf interchange on the highway west—in the form of cute sculptures. Ankara being a young and modern city makes her face an identity problem. The increase of population from couple thousand to several million in less than a century means that almost everyone came here from somewhere else. Finding a native "Ankarali" is challenging, as a result. The population and culture of Ankara, therefore, is a mixture of everything Turkey offers, with people of origins from all cities of Turkey. Ankara is quite a large city, with different towns and neighborhoods of their own characters. In a very simplified manner, most attractions of the city run through the long Ataturk Boulevard, running and diving the city north to south. Starting from Ulus Square, going towards south in Ataturk Boulevard, you will reach Kizilay, Kavaklidere and then Çankaya. As you pass through these districts one by one, the standards visibly increase. Ulus is the historic center of Ankara, with most museums, early republican buildings, and the ancient Ankara Castle. Being the most elegant center of the republic in the beginning of the 20th century, now the area has left its charm, and is a messy, crowded neighborhood. Unless you are looking for the real cheap, (rather than some specific selections) not recommended for dining, accommodations or nightlife. In case you are interested to get a feeling of how life was once in Ankara, find Hamamonu District, the newly restored neighborhood with old Ankara houses. A famous spot for the conservative Ankarans, walk through the narrow traditional streets, and sip your Turkish coffee in an historic wooden house, especially at the night. Do not expect to find alcohol at Hamamonu. Next, Kizilay is the working class center of Ankara. The famous Kizilay Square, named after the now-demolished "Red Crescent" headquarters building, is Ankara's political center. Throughout the decades, lot's of protests and rallies has taken place in the square, and even today, this is the center of the political protests. Many roads and streets around Kizilay are better discovered on foot, and there are lot's of budget restaurants, cafes, bars, and clubs of different taste. Sakarya Caddesi (Sakarya Road) is a messy pedestrian area with fisheries, street sellers and restaurants. Pass over the southern side of Ziya Gokalp Caddesi, the parallel vehicle road, and you will reach the district around Yuksel Caddesi (Yuksel Road). This pedestrian neighborhood is a left oriented area, with several culture centers, cafes, pubs, restaurants and bookstores. Many locals looking for quality avoids Ulus and Kizilay. Continuing southern, the area after Kizilay and up to Kugulu Part (Swan Park) is Kavaklidere, also simply known Tunali district (Tunali Hilmi Caddesi/Road runs parallel to Ataturk Blvd, and locals simply name it and around as Tunali.) The area is more cosmopolitan, open minded, and popular among the young. The back streets are full of cafes, restaurants, pubs to rock venues. Walking up from Kugulu Park (Swan Park), pass to Arjantin Street and in the end, turn left to Filistin Street. These two are where the top end cafes and restaurants are found, full of Ankara's chick and elegant going there to see and be seen. Further south, you reach Atakule Tower at Çankaya, the diplomatic center of Ankara, with the Presidential Palace and most embassies. From Kugulu Park to up, Ankara's nicest parks are aligned, namely Segmenler Park and Botanical Garden, in addition to small but cure Kugulu Park. Rather than this alignment on Ataturk Blvd., check Bahçelievler District, west of Kizilay. 7th Road (7.Cadde) and around is a student oriented and family friendly region with shops, cafes and restaurants. Further west, through Eskisehir Road, you will pass through the once suburban neighborhoods of Bilkent, Umitkoy and Cayyolu, which are new modern towns, less of an interest to tourists, but offers good dining and nightlife. Visit Park Caddesi, the areas newly created nightlife center. Ankara is well connected by a good public transport network system. Private and public bus operators compete for your patronage and there are the 'dolmus' minibus transport providers that offer rapid tranfers and get you to your connection points. The underground subway 'Metro' is highly efficient which runs between outer suburbs and the interstate bus terminal 'ASTI'. Taxis are readily available and are probably the best way to get to your destination, relatively inexpensive for the time poor traveller. As any other part of the Anatolian highland, Ankara has continental climate. The winters are cold and usually snowy. Temperature is commonly below the freezing point during this season, but it rarely drops below -15°C at nights. Thanks to the low levels of relative humidity, the hot and dry summers are more comfortable than coastal regions of Turkey. Average daily temperatures in midsummer are around 30°C. Daily temperatures can reach 35°C and above, but is not common and usually last no more than a few days. Summer nights are cool, though, so be sure to bring at least a cardigan with you to wear outdoors. Spring and autumn are the wettest seasons, but with an annual rainfall amount of 415 mm (i.e., a semi-arid climate), you are unlikely to get much wet during your trip to Ankara, anyway. The brand-new airport terminal was opened in 2007. It features many more gates, a more orderly parking system, and in general, better traffic flow. The road connecting Ankara's airport to the ring road has also been fully renovated. Airport buses are operated by Belko Air, who operate a fleet of modern coaches. The bus number is 442 and it stops at multiple locations including Aşti (where intercity buses depart), Kızılay (the city centre) and Ulus (the historical center of the city, close to the museums and baths). The price is 8 TL. Bus 442 runs in a loop and buses depart frequently (roughly every 20 minutes). It is possible to take this bus from any of its stops back to the airport. Tickets can be bought on the bus after boarding. Note that announcements are made only in Turkish and you may not find any English-speaking staff. This is the most economic way of reaching the city center, after which you can take a taxi. A taxi drive from the airport to the city center should cost around 60 to 80 TL, depending on your destination. Being in a central location in Turkey, Ankara is also the centre of the Turkish rail network and can be reached from many cities. There are now high speed services to Istanbul and Konya. The new high speed train from Istanbul to Ankara takes around 3 hours and 30 minutes. Services are currently leaving from Pendik station, which is a suburb on the Asian side of Istanbul reachable by bus from Kadikoy (1 hour) or taxi from Kartal metro station (10m). The price is 70 TL. High speed trains also run frequently during the day to Eskişehir and Konya, and both destinations take less than 1 and a half hours, allowing day trips from Ankara. All trains are operated by Turkish State Railways. The train station is located north of Kızılay Square, which it is connected to by a wide number of public buses which stop at right in front of the station. About 10 minutes walk, on the other side of Gençlik Park, is Ulus metro station which has services to a number of central locations in the city in addition to Kızılay. If you are traveling from places other than Istanbul, you will find buses fast, inexpensive, and modern. The buses terminate at the bus station (otogar) named AŞTİ (pronounced ush-tee and almost exclusively known as such locally; Ankara Şehirlerarası Terminal İşletmeleri) standing for "Ankara Intercity Terminal". Most of the cities in Turkey have direct buses to the capital of Turkey, and buses are much faster than trains in Turkey. From Istanbul to Ankara, the bus trip takes around 5 hours and one way fare is about 35 TL. Hundreds of companies operate buses to anywhere in Turkey. The companies with bigger ticket desks in AŞTİ are most of the time more convenient, but more expensive. 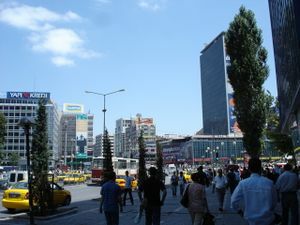 AŞTİ is connected to the Kızılay Square and a number of other central locations by a metro line. There are also free of charge shuttle buses to Kızılay (and a number of other locations) run by the AŞTİ administration. They depart from behind the main building. The city has a dense public bus network, a two-line subway called Ankara Metrosu and a single line suburban railway called Ankara Banliyö Treni. There are two types of public buses in Ankara; those run by the Ankara Municipality named Ankara Belediye Otobüsleri (EGO) and those run by a private corporation named Ankara Özel Halk Otobüsleri (ÖHO). You can differentiate these two types by their colors. EGO-run buses are white and blue while ÖHO-run buses are blue. Both types of these public buses use the same bus network and bus stops. The Ankara Municipal Buses, named Ankara Belediye Otobüsleri (EGO), consists of an extensive and dense bus network, and is owned and operated by the Ankara Municipality. Payment system for municipal buses is based on multi-use magnetic cards which is also used for the metro; starting from the smallest available which is the 2-unit cards which cost 3.50 TL, 3-unit cards which cost 5.25 TL, 5-unit cards which cost 8.75 TL, 10-unit cards which cost 17.50 TL and 20-unit cards which cost 35.00 TL . Transfer with the magnetic cards is possible within a duration of 45 minutes between the bus lines and metro lines with a cost of 0.59 TL . The magnetic cards cannot be purchased in buses and have to be purchased beforehand at kiosks and metro stations. The Ankara Non-Municipal Public Buses, Ankara Özel Halk Otobüsleri (ÖHO), consists of an extensive and dense bus network, operated by a private corporation. Payment system for non-municipal buses is with cash. The ticket, which is only a one-way ticket, is purchased in buses at a cost of 2.40 TL. Dolmuş are private run minibuses. They are as common as buses and run on their specific routes. Guven Park at Kizilay Square is the main stop of dolmuş's, running all sides of central Ankara. You can get in and out anywhere on their route, and they stop the same way you catch a taxi with your hand. The prices range depending on your departure point and destination, but typically not more than a two to three liras. The Ankara Metro, named Ankara Metrosu, consists of three (four, if you count Batıkent-OSB Törekent as a separate line) metro lines, which are called Ankaray and Ankara Metro which is owned and operated by the Ankara Municipality . The west-east light-rail line named Ankaray and the north-south heavy-rail Ankara Metro line are both mostly underground lines and intersect at Kızılay station.Currently,it is possible to go all stations with one payment. The Ankaray line runs between AŞTİ (Ankara Şehirlerarası Terminal İşletmesi - Ankara Intercity Bus Terminal) and Dikimevi. The line is 8.7 km long (8.0 underground and 0.7 km surface railway) and has 11 stations.Except Emek station,all stations are under the ground. The Ankara Metro consists of three lines (M1-M3). M1 Line (Kızılay-Batıkent) is 14 km long and it has 12 stations.In Feb 2014,M3 line opened as an extension. M2 Line (Kızılay-Koru) has 11 stations and it's 16 km. Ironically,this line has a station named MTA (company who runs New York Subway) M3 Line (Batıkent-OSB Törekent)opened as an extension to M2 line.To reach this line from M2,leave the train (came from Kızılay)in Batıkent and move to other track. Payment for the subway is based on multi-use magnetic cards which is also used for the municipal buses; starting from the smallest available which is the 2-unit cards which cost 3.50 TL, 3-unit cards which cost 5.25 TL, 5-unit cards which cost 8.75 TL, 10-unit cards which cost 17.50 TL and 20-unit cards which cost 35.00 TL . Transfer with the magnetic cards is possible within a duration of 75 minutes between the bus lines and metro lines with a cost of 0.67 TL. The magnetic cards can be purchased at kiosks and metro stations. All stations are announced both on a display (in newer trains used in M2 and M3)and by voice in the metros. The Ankara Suburban Railway, named Ankara Banliyö Treni, consists of a single suburban line running on the national rail network which is owned and operated by the Turkish State Railways. The suburban line, runs between Sincan in the west, through the city center, to Kayaş in the east. The line is 37.0 km long (all of which is surface and elevated railway) and has 26 stations. No points of interest for visitors in these suburban destinations. Payment for the subway is done by cash at each train station for a one-way ticket which costs 1.70 TL and a return ticket which costs 3.00 TL . Taxis are numerous in Ankara and are recognizable by their yellow color and word Taksi on top of the car. All licensed taxis have the letter T in their license plates. The fare shown on the meter reads according to distance traveled. The ride will start at 2.20 TL, and the rate is 1.90 TL per kilometer. The rates for day and night are same. Tipping is not done. Occasionally, some taxi drivers will refuse to start the meter and try to negotiate a fixed price, especially with tourists. But most taxi drivers will start taximeters at all times. You should avoid these cabs and simply take another one as you will almost certainly end paying too much. Many taxi drivers, even though very few of them speak a foreign language, will understand your requested destination and instructions. Tell them then to put the taximeter on. Taxi drivers do normally work with the taximeter, so they will not be surprised at all when you ask them to put it on. Emphasize to the taxi driver that you will pay for the meter price before getting in. Always try to stop a taxi that is passing by on the road or find a legitimate taxi stop. If you are not familiar with the city and see that you are a tourist, the taxi driver may drive a detour in order to charge you more. Insist on going to the destination that you want, and have a map to show them your destination, to avoid a detour. Also beware that all taxis are required to have the designated license plate with the letter T apart from their yellow coloring. Be careful on what notes you hand them for payment; some taxi drivers have tried to pretend that the 50 lira note that was handed was just a 5 lira note. Occasionally taxi drivers may actually also rip notes you give them, and tell you it is no good, in order to make you hand them a 50 lira note. So, make sure the notes are not ripped, and is actually the right one before you hand them over. Do not buy their quick-sell tricks and also do not allow them to round the price up to the higher denomination. 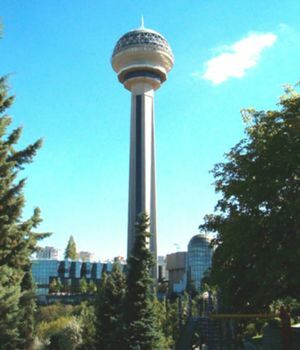 Atakule Tower in Çankaya, Ankara. Ankara has several historic buildings and landmarks, mostly concentrated around Ulus. On a quick visit, one can get a taste of most important historic places in a day long trip. If you have even less time, two never to miss places are Anitkabir and Museum of Anatolian Civilizations. 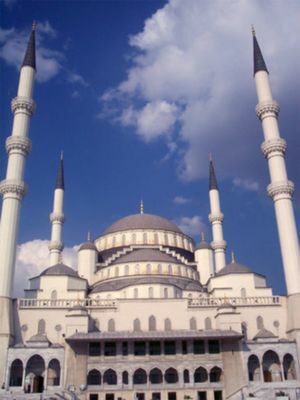 For longer stays, Ankara has lot’s to offer as the modern capital of Turkey. Ankara Castle, Cengelhan - Rahmi Koc Museum, Museum of Anatolian Civilizations are all 5 minutes of walking distance, and very close to Ethnographic Museum, State Art and Sculpture Museum, Haci Bayram Mosque, Salt Ulus, Augustus Temple and Roman Baths; all of which are located in Ulus. Hacı Bayram Mosque, located next to Augustus Temple, Haci Bayram Mosque was first built in 1427, but later on modified to its current structure in the 17th and 18th centuries. The impressive interior has a wooden ceiling, and Kutahya tiles. Haci Bayram's memorial tomb, built in 1429, is next to the mosque. Anıtkabir, open daily, museum open daily except Mondays - situated on an imposing hill in the Anittepe quarter of the city is the mausoleum of Mustafa Kemal Atatürk, the founder of the Republic of Turkey, completed in 1953. The Museum of Ataturk and War of Independence is located inside Anıtkabir, including a large collection of Atatürk memorabilia and paraphernalia, and a section for the War of Independence containing panoramic views of the war fields. Turks show a big respect to Atatürk, and millions visit Anıtkabir each year. Unlike the mournful visits on 10th November, his death anniversary, Turk turn Anıtkabir into a fairground of celebrations on national holidays. Visiting Anıtkabir on one of the national holidays is a great experience: April 23 - National Sovereignty and Children's Day; May 19 - Commemoration of Atatürk, Youth and Sports Day, August 30 - Victory Day, October 29 - Republic Day. The site and the museum are free of charge. Expect a security check at the entrance to the area. 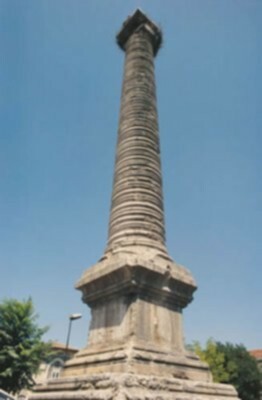 Atakule Tower, Çankaya. One of the highest structures of the city, with a shopping mall located under the tower. (Note: Atakule shopping mall itself, where very few shops are left open, will close in autumn as it will be transformed to a hotel.) (10 TYR from 10 till ? ): In the top of the tower, there is an observation desk, giving good views of the city. To reach Atakule, you can use any bus what have in it route this point (i.e. Atakule) (it’s be good idea because tower situated on the hill it cost now 1.75 TL be EGO-card or 2 TL on monetized bus. You may return by step via Cinnah Caddesi and continue your path by Ataturk boulevard. It will take to Kizilay about 40 minutes on heavy traffic, much shorter on non-peak hours. Ulus and Republican Ankara, the historic Ulus on and around Ataturk Boulevard has many buildings built during the early years of the republic. Once the center of Ankara, the architecture is also effected by the republican revolutions. Observe the façades of the buildings, which mainly show a national movement effected by the revolution, using neo-classical Turkish symbols and in contrary to the Arabic influences of the Ottoman period. Better examples are the State Art and Sculpture Museum Building, Ethnography Museum Building, and historic bank buildings on Ataturk Boulevard. Hamamönü, is a recently restored neighborhood with Ottoman style timber Ankara houses, and one of the most interesting parts of Ankara to visit. Located down the hill from Ankara Castle near Ulus, Hamamonu is an entire neighborhood of narrow streets, old houses and historic buildings. Most old houses are now restaurants, cafes or souvenir shops. In addition to the neighborhood itself, there are 4 historic mosques to visit: Haci Mussa Mosque, Tacettin Sultan Mosque, Karacabey Mosque, Sarikadi Mosque. Mehmet Akif Ersoy, the famous Turkish poet also writing the lyrics of Turkish National Anthem, had his house here, which is now a museum named after him. His statue is also placed in the central square. The Art Street is full of shops selling local art crafts and souvenirs, and the Hand Crafts Market is where local women sell their crafts and works. Hamamönü can be visited day or night, but especially in good weather, it is more alive after dark. During the month of Ramadan, the local municipality organizes lot's of events in Hamamönü, and the area gets entertaining after dark, but also very crowded. Hamamönü is one of the best places to get a feeling of what an Ottoman town was like centuries ago, and get a sip of Turkish coffee, a breath of nargile - smoke pipes, or just gather around. Don't expect alcohol in the restaurants in this neighborhood for conservative Turkish taste. Teleferik, is a newly-built cablecar starting from Yenimahalle metro station. It has two stations and will be extended in the future. For now it is free of charge. State Art and Sculpture Museum, (near the Ethnography Museum). Hosts galleries with temporary exhibitions as well as a permanent display of Turkish art from late 1800s up to today. Ankara Ethnography Museum, Talat Paşa Bulv, Ulus (opposite the Opera House). Exhibits traditional Turkish clothes and goods. Çengelhan Rahmi Koç Museum, . The industrial museum is established next to the entrance of Ankara Castle in Cengelhan, an historic caravansarai. The technological progress from 1850s onwards is on display in this museum housed in the building. The museum contains various curios and collectibles including model trains to model sowing machines. It also contains a good collection of children toys and rooms hosting assorted technological collections such as cameras, diving equipment, telephones etc). Most objects are from the private collections of Koç family, owners of Koç Holding, one of the two largest conglomerates of Turkey. Koç Holding's founder, Vehbi Koç, has started business in the small shop located in the center of the building in early 20th century. Admission is 6 TL for adults. The excellent Divan Restaurant is hosted inside the museum. War of Independence Museum (Kurtuluş Savaşı Müzesi), Ulus Square. This originally was the building which hosted the First Turkish Grand National Assembly, in which the War of Independence, fought in 1921-22 was directed from, as evidenced by photographs and other items in the display. Waxworks of former Turkish presidents are also on display. Salt Ulus. Located in an historic building in central Ulus, Salt Ulus offers free exhibitions. Follow them at saltonline.org for their events. Atatürk Bulvarı 12, Ulus. TCDD Open Air Steam Locomotive Museum. An open-air museum. Ankara Aviation Museum, Etimesgut (near highway to Istanbul). Various aircrafts, aviation items, missiles, and whatnot are in the exhibition, as well as a number of MiGs from the other side of Iron Curtain. It’s museum not so large like same museum in Istanbul, but may be a interesting too. It’s full name is Hava Kuvveterlı Müzesi, i.e. Airforce museum. You can reach this museum by taking shared taxi (minibus) aka dolmuş from Ulus bus station. It can be reached in such way: on Ulus square you must find Ataturk on the horse monument. Let stay back to monument’s face and cross the crossroad with traffic light. Straight go down till next traffic light. On this cross road turn right and you immediately see bus station with many blue or blue and white minibus. You must find bus stop on Etimesgut Try to show museum name to driver. He must say “Tam” and nod by head. Driving time on good traffic condition about 20 min (2 TYL). Driver drop off you on pedestrian crossing, you must cross highway and continue forward motion in your minibus direction (about 5-10 min, be aware this way not very comfortable) while you not see anti-craft missile complex, then turn left and near missile you are see museum entrance (red brick booth). Entrance fee in april 2013 is 5 TYL, working time something like 9-16, but it not true in last point. Backing to Ankara about same: you go out on highway’s margin and hitch minibus what driving to Ulus (20 min, 2 TYL). METU Science and Technology Museum (on Middle East Technical University campus, on the highway to Eskişehir). MTA Museum of Natural History, (MTA Tabiat Tarihi Müzesi)A museum on nature, fossils, geology. Located on the highway to Eskişehir. Ankara Castle. Standing above Ulus, on a high hill overlooking Ankara, Ankara Castle is a medieval citadel of more than a millennium old. Ankara Castle and the buildings inside are partly restored, and the area of the inner caste closer to the main gate is the better side. If you walk further in, many of the buildings inside the castle are worse in condition, and house the poorer residents of Ankara. There is a wider program of restoring the castle and the surrounding neighborhoods, which is going rather slow, but changes are visible. Outer castle is similarly interesting. On the opposite side of the main gate is Cengelhan, now hosting Rahmi Koç Museum. The old caravanserai is excellently restored, and gives a good idea of how the area was once. The narrow street running below through the entrance of Rahmi Koç Museum is full of shops selling antiques, Turkish silver-works and souvenirs. Temple of Augustus. Located next to Haci Bayram Mosque, the Temple of Augustus was built in the first century BC. Also known as Monumentum Ancyranum, the temple walls has the best preserved text of Res Gestae Divi Augusti in the world. Roman Bath. The outdoor museum is formed of the ruins of an ancient public bath remains from the Roman Empire. In order to follow the events and performances in Ankara, online ticket sites of Biletix and Mybilet are good places to check, and both are available in English. Most local newspapers and event websites are in Turkish, and give a wider information about the daily events. 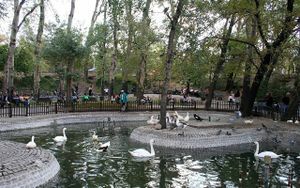 Kuğulu Park is a public park in the Tunalı Hilmi Caddesi, the park is known for its swans. Ankara has annual festivals, including Ankara International Music Festival, Ankara International Jazz Festival, Ankara International Cinema Festival and lot's more, and it is always good to check what's going on in the city. Ankara Modern Arts Center (Çağdaş Sanatlar Merkezi), opposite the American Embassy in Kavaklıdere, at Atatürk Boulevard has free exhibitions and performances, mostly of local and infamous artists, but sometimes of more impressive ones. Local and national groups play in Ankara bars and venues especially on the weekends. Sunny days get crowds fill Tunali Hilmi Road in Kavaklidere, and 7.Cadde in Bahçelievler. Ankara offers a good selection of cinemas both in Kızılay and Bahçelievler, as well as all shopping malls. There are several concert halls for classical music and opera. Many universities promote concerts and spring festivals but these are sometimes open to their students only. Folk and traditional music is very alive, from small bars and restaurants to big concert halls where you can find local stars. Depending on your interests, you can find trekking in local parks and in the surroundings, visiting the museums or hunting for the Ottoman or Selçuk remains in the ancient castle. Upscale shopping centers like Armada along the Eskisehir road also offer cinemas and quality restaurants. Ankara's Castle (Kale) has been a trade center for centuries, and its sellers of carpets, leather and antiquities are slowly moving upwards hoping to attract the tourist trade. It's still a delicious place for walking and browsing, and there are family firms where you can buy, for a price, excellent carpets and kilims. Walking down from the Castle you can walk through the covered market, an iron structure where you can buy very cheap and excellent products. Expensive and Fashion: Vakko, Beymen, Sarar, Tüzin (women only), Roman (women only), Fabrika. Mid-range: Kigili (men only), Boyner (Department Store). Budget and Casual: Koton, LC Waikiki, Defacto. Originally a glass manufacturing firm, Pasabahce shops sell Turkish glass art-work for all budgets. They are excellent as unique Turkish souvenirs. Tunali Hilmi Road is the most known street shopping area, but the shopping mall boom has caused it loose some of it's charm. For Turkish jewelry and silverwork, check Kugulu Pasaji (old-style shopping complex), opposite Kugulu Park (Swan Park) in Tunali Hilmi Caddesi. The distant historic town Beypazari has nation wide famous hand made silver-works. Best place to buy is the Jewelry Market (Kuyumcular Carcisi) in Beypazari, but if you do not have the time to visit Beypazari, Kugulu Pasaj jewelries also shall have such art work. Ankara is best known with its "döner kebap". In order to pick a good döner restaurant (there are many) you should take a look at the döner round. it should be rectangular and the cuts must be flat and separated. Like many other capitals, Ankara is where you can eat the best and the freshest fish of the country all around the year (not the cheapest, though). Around Sakarya str., there are various types of fish restaurants, from fast food to stylish ones and it can be a good opportunity to also try rakı, which is known as a companion of fish. But fish restaurants abound in the city; in Cankaya there are at least three excellent ones, Kolyoz Restaurant ( www.kolyozbalik.com) , "Akdeniz Akdeniz" and "Lazoli" featuring the first Mediterranean and the second Black Sea cuisine. "Ege", located close to Tunali street, is another excellent choice for fish and raki. The restaurant has also a variety of wines. If you want to listen good Turkish Classical Music while you eat and drink raki, then "Sudem" should be seen. It is located on Olgunlar Street. Besides many classic iskender kebab restaurants there are also many restaurant featuring the traditional cuisine of a specific city, catering to the community of more affluent immigrants: from the spicy Urfa to the variety of vegetables coming with Adana kebab. Uludag Kebabcisi on Denizciler Caddesi in Ulus has been around for about sixty years and is a top of the line restorant mainly serving Iskender kebap. "Papsi" is a good choice to take a cold beer in a friendly atmosphere for years. It is located on Tunali Street. "Kitir" and newer "Random" are two other most popular bars, adjacent to Kugulu Park, also in Tunali. Corvus is on Bestekar Street offering Rock Music. There are many bars and places to drink on that street which is parallel to Bestekar. The Edge, Twister, Hayyami (wine bar) are nice places. Sakal on Kennedy Street is a unique place with electronic, reggae or retro (offering different kinds of music). On the same street Mono is pleasant place to drink. Tunus Street, parallel to Bestekar is another street where you may find many pubs like Retrox, Flat, James Cook and Zodiac. If Performance Hall, Manhattan, Overall and Siyah-Beyaz are places where you can drink and dance till 4 am with live rock music. There normally are rock cover bands and a huge crowd, especially on Friday and Saturday nights in these places. "Sakarya" is full of the cheapest solutions. Among the best places in Sakarya, one should note "Net", which is a good choice not only take a glass of beer or raki, but also to eat. "Buyuk Ekspres" is also a nice old bar of the town. Also Eski-Yeni, Pasaj and Telwe are nice bars where you may find rock or alternative live music styles with cheaper drink prices compared to Tunali, Cankaya region. "Park Avenue" -in Konutkent district- is the new street for classy bars, cafes and night clubs. You may also find second branch of Kitir, Random & Crossroads in "Park Avenue". Istanbul's fashionable night club Sortie has also opened in this avenue and is a nice place to drink any kind of drinks and listen to latest club mixes. Narquilla is a great place to have your nargile while drinking beer and enjoying nice food. Also, there are meyhanes (tavern) in which fixed menus are served with drinks and classic Turkish music played. There are bars and restaurants also in the historic core of Ankara, close to citadel. You definitely have to go and return by taxi though. Don't expect a lively gay life of Istanbul in Ankara. No-one comes to Ankara for its amazing gay life, however you can still enjoy your time while you are here. It has only one gay bar-club (Sixties) and this is open only on Wednesday, Friday and Saturday nights. It gets pretty crowded after 00:00 and plays Turkish and Western pop music. In addition to that, though it is not a gay bar, Eski-Yeni Bar in Sakarya Caddesi (street) seems to attract a gay-lesbian crowd especially in its bottom floor. Kaos GL and Pembe Hayat, the leading queer organizations in Ankara, hold activities throughout the year. The Sheraton Hotel, located in the Kavaklıdere district, is the most visible and glitzy hotel in Ankara (and has the prices to prove it). Around the corner from the Sheraton lies the Hilton, which is a bit past its prime but still a very acceptable place to stay. The Radisson (located in Ulus, near the train station), the Swissotel (located on an obscure back alley in in Çankaya) and the Ramada (in Kavaklıdere, on fashionable Tunalı Hilmi street) are recent entrants, and offer very new-looking rooms that are nevertheless a tad smaller than those at the Sheraton or Hilton. Independent hotels of note include the King Hotel (behind the Parliament, near the American Embassy), and Hotel Midas and Hotel Gold (both north of Kavaklidere on Tunus Caddesi). Angora House in the Citadel district is a charming boutique hotel in an Ottoman era house. In terms of budget accommodation, there is one hostel in the city center name is Deeps Hostel.Prices start from 25 tl to 40 tl.Web site is www.deepshostelankara.com. And also a number of cheap hotels can be found along Sanayi Caddesi, just north of Ulus Meydan: a double (en suite) at such hotels lists for 40-80YTL per night. Note that rates are usually negotiable and may or may not include breakfast. Most people, including single female travellers, would very rarely encounter problems walking along the streets alone at night. Street crime is extremely rare, even late at night. However, "little crime" does not mean "no crime", and common sense should still be applied as anywhere in the world. Petty crime such as pickpocketing can occur, however, especially in crowded areas. Therefore, one should always take care of one's belongings and keep bags closed. The biggest danger for travellers is the road traffic, because there is little respect for pedestrians. Every road should be crossed carefully and very quickly. Even if pedestrian traffic lights show green, it is absolutely essential to have a watchful eye. At crosswalks definitely look out before crossing the street. Another danger for pedestrians is the sidewalks because they are often in a very poor condition. Because of the poor or irregular renovation of sidewalks, many of them have loose paving stones and holes in the asphalt. The risk of tripping and hurting oneself should not be underestimated. Ankara Police Department has a "tourism police" section with staff multilingual in English, German, French, and Arabic. Turkish is an Ural-Altaic language, closely related to Azeri, Turkmen, Uzbek, Tatar, Kazakh, Kyrgyz, Uighur and many other languages of the Turkic language family. The grammar is different from most European language (rather than Hungarian, Estonian and Finnish, with have related structures), making it complicated to understand at the beginning. Learning Turkish can open new doors, as well as the hearths of the Turks. One of the most reputable institutions for serious language learners is Ankara University’s TOMER. TOMER has it's main language schools in Ankara, and has branches in multiple cities throughout Turkey. There are other private courses offering Turkish also. The most economic way for longer staying expats is to find a Turkish friend, willing to exchange teaching Turkish to learning / practicing English or other languages. Beypazarı to northwest is famous with its traditional houses, mineral water, bazaar, and of course bakery which is called Beypazari Kurusu. It is a quite a lot for a small Anatolian town which make them tourism attraction of the area. You must spare a weekend. You will not regret it. Gordion is one of the most important ancient cities in Turkey and is 96 km west from Ankara in Yassihoyuk, near Polatlı off the highway to Eskişehir. The city had been home for Hittites, Phyrigians, Persians, Greeks, and Romans since 3000 B.C. The remnants of the city are displayed in Gordion Museum and Anatolian Civilizations Museum in Ulus. Kızılcahamam to north is a town with many thermal springs, surrounded by forests—a welcome retreat from the arid landscapes around Ankara. Boğazkale to northeast is the hub for visiting ancient Hattuşaş, the capital of Hittites. Ankara is a reasonably convenient place to base yourself if you want to travel around Anatolia, Cappadocia or the Black Sea coast and a growing number of tour operators and related service industries are catering to tourists. There is accommodation here at all levels, with prices pegged below those of Istanbul or the south coast, and the new bus station (AŞTİ) is probably the most useful transport hub in Turkey with services to just about anywhere that's feasible (Lebanon is only 16 hours away, if you're feeling adventurous). This page was last edited on 20 December 2018, at 14:49.